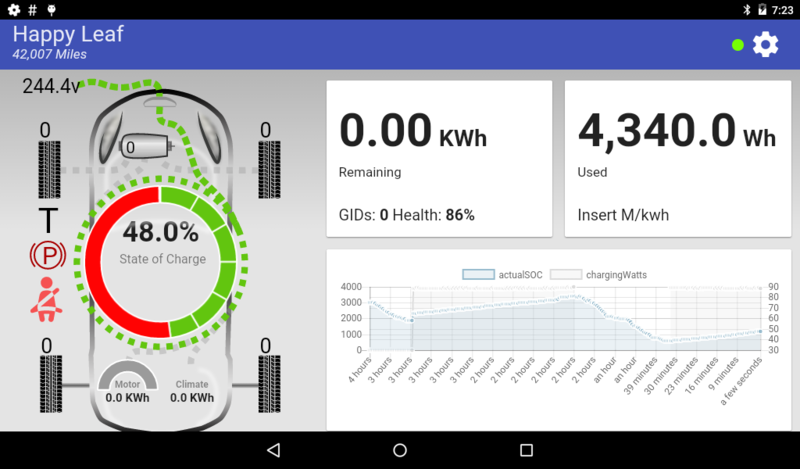 I've been writing an Android/iOS app that borrows interface elements from other Hybrid/EV cars to display data from a Bluetooth ELM327 OBDII device for the past month or so. It's really shaping up well, but before it's ready for the Google Play store, I have a lot of work ahead of me. I don't think I'll be able to perfect the ELM237 interaction without some insight and feedback, so without further ado, I present to you, Happy Leaf 0.2! 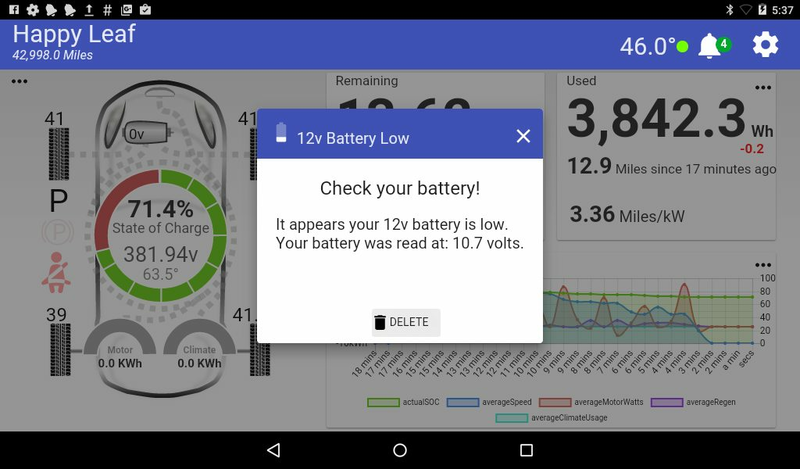 When the battery SOH changes a notification is triggered that displays the previous SOH, current SOH and odometer at the time of the SOH change. All BLE devices will show in "Nearby Devices"
Only tested on one model of BLE, please let me know if you can't connect. Please send OBD model. Higher priority messages will be requested more frequently than lower priority messages. Will eventually dramatically increase performance. May be slower on some commands for now, more optimization will be required over time and future updates to fine tune the flow. Connection/verification messages now through Flow Manager, increased reliability when trying to reconnect. New in settings -> Connection -> Allow Wifi. Happy Leaf won't re-enable Wifi if this is disabled. New in settings, should convert units based on preference. Will still auto detect units and adjust accordingly. Tested converting my U.S. LEAF to Km / C, seemed to work. - Fixed issue where newest data would be deleted, now correctly purges oldest data from memory. No longer time based, strictly based on 2,000 history limit. Alert for rapid increase of battery temperature. - [NEW] Settings icon on Welcome screen. - Adjusted font sizes on blue title/footer bars. - Moved charging animation "cable" to right side of diagram, now charging voltage doesn't overlap with dropdown icon. - [NEW] Save logs / history to sdcard or internal storage. Disabled by default as this affects performance. Can be enabled from settings page. Will only send the same notification after 30 minutes. - Updated colors, red on SOC meter not as bright, background color closer to white in light mode. 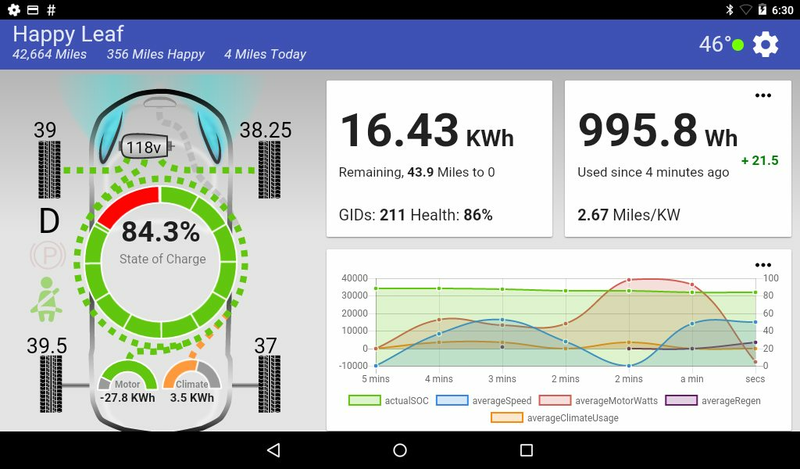 - Enlarged Motor watts / Climate usage charts. Shrunk SOC meter slightly. - Fixed Tire layout to match reality. 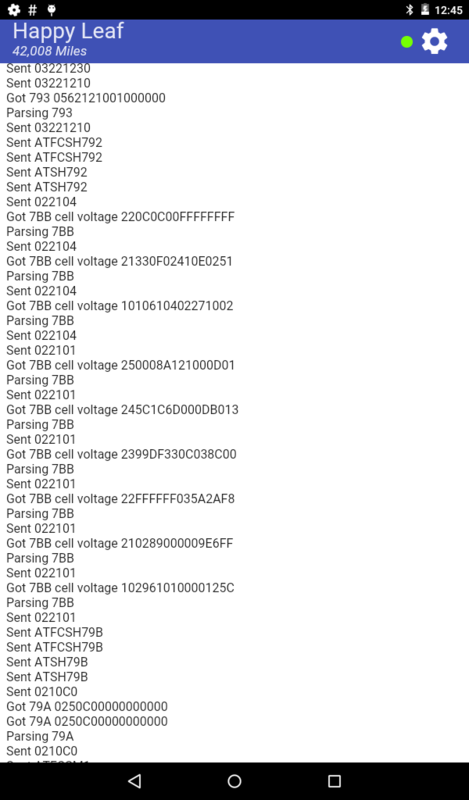 - Various checks to incoming OBD data to ensure consistency. - Outside temp adjusted to documented spec, still doesn't match Leaf's display, but this could be due to a different thermometer being read. Found other codes that represent outside temp, but currently not implemented. Settings for toggling light sensor, and sensor sensitivity. Most font now scales based on percentage of screen. Should look much better on any screen size, any orientation. 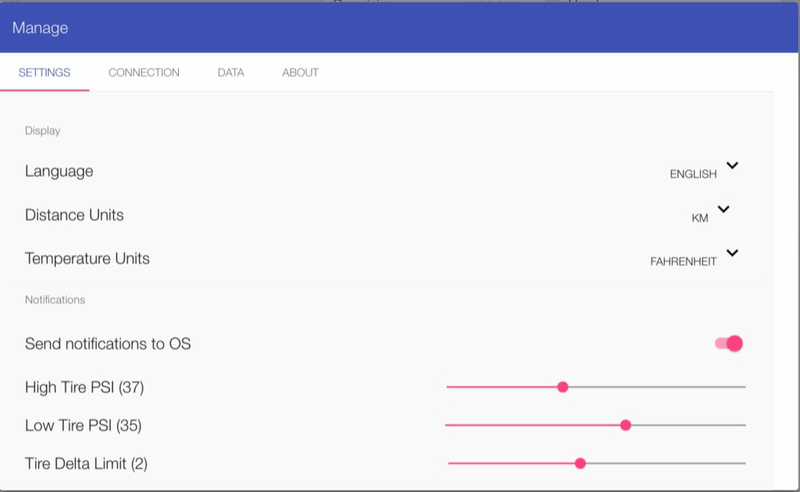 Graph data points now average based on screen size. Smaller screens will be more readable when large amounts of data logged. - Attempting to address issue where dash set units differ from manufacture units. If your odometer reading is off by ~60%, but displays the correct unit label. Added total miles driven while app logging, and total miles today calculation. Thank you TickTock, Turbo(s), Gary and others for gathering and sharing this knowledge. 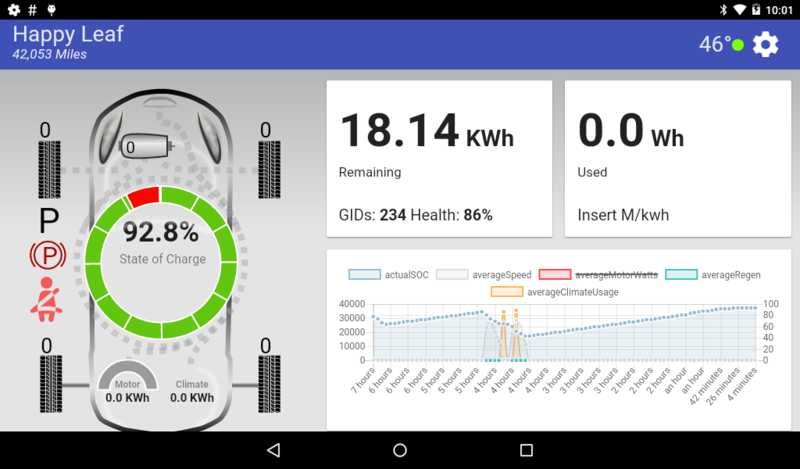 In my daily life, I depend on the OBDII connection to track watts used, M/kw per trip, and occasionally diagnostic. I had so many ideas, and wanted to visualize the data deeper than currently available apps. After this breakthrough, the app started taking shape, and works better than I dreamed. 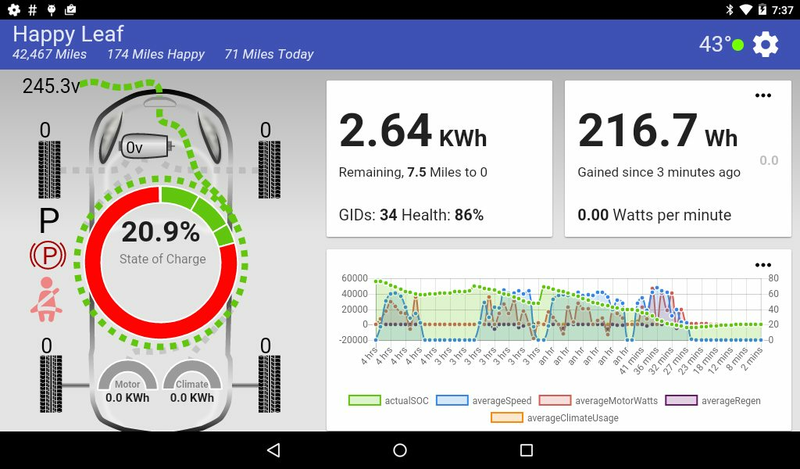 Happy Leaf's primary goal is to be a pretty interface for data, not a diagnostic tool. 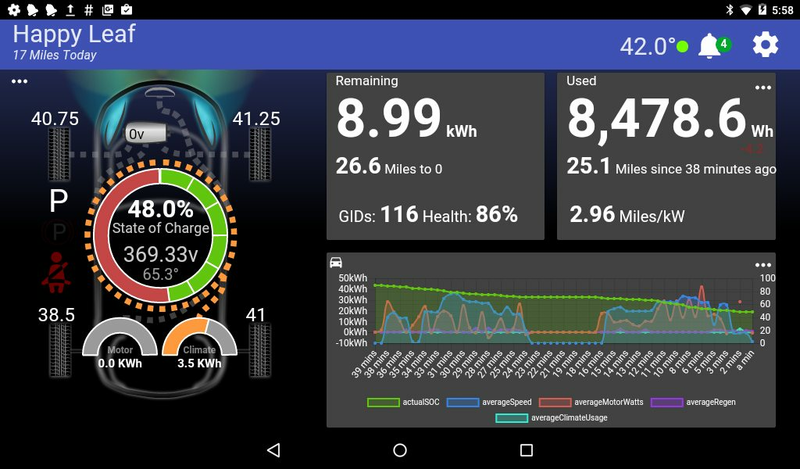 I created a Leaf diagram using SVG that holds tire data, SOC data, energy movement, climate usage, motor output, and headlight status. 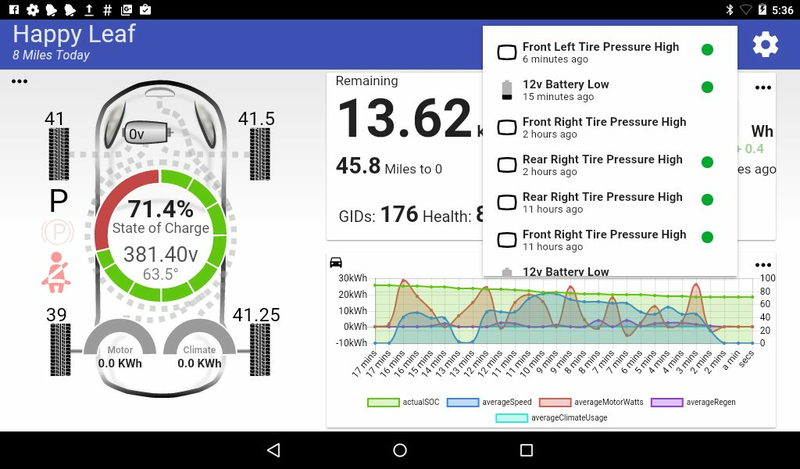 This is the meat of the app, it easily visualizes what is going on with the vehicle. The interface runs extremely well on the two Android devices I have available to me. A $50 Kindle Fire 7" (Android 5.1.1), and a 2012 Motorola Photon Q (Android 6.0.1). Both are rooted and have custom roms, so your results may vary. I highly recommend a tablet for this interface, phones just don't have the real-estate and I haven't spent a lot of time optimizing (though the css wouldn't take long). The app is clearly far from finished, but it's getting so close that I'm not sure how much farther I can take it alone. There's still many bugs, missing features, and currently slow query times. If you are interested in testing this app, fill out the form here. There's still much testing/tuning to be done so it's results may vary. Last edited by bmartin on Mon Mar 05, 2018 1:03 pm, edited 12 times in total. 2012 Nissan Leaf SV - Purchased June 2015 with 16.2k miles. I'm still unable to get certain codes, many EVCan codes I can't find or filter for, and I'm at a loss to any 792/793 codes. I can get detailed SOC with 7BB responses, but that's the extent of ATFCSH messages I'm querying for. I feel like I've read a good third of the OBD discussion on this forum, this has given me a pretty good footing, but many details of how to request certain codes, are not discussed, or my understanding isn't clear enough to make sense of what was discussed. These commands I can't seem to find, even when filtering for them directly. At first I was reading 1 message at a time, it took over 12s to get a full round of messages (and I was only needing more and more), I discovered the use of ATCF. ATCRA, and ATCM, though ATCM isn't very useful at the moment. Now I do a loop with three or four filter/receive commands to get a second or two of message streams of various messages. At the end, I look for the 7BB SOC, and restart the cycle. In under 7 seconds I'm reading many more commands in more real time, the same message can come through ~10-20 times during that 7s block. I then do a simple ATAR, ATCRA, ATMA to get a Buffer Full of codes. I do a few ATCM7FF, ATCF(MSG) requests for specific commands that I can't get in a mask/filter. I still don't have the filters 100%, at this moment it is a lot of guesswork to get codes that align with interface needs. I'd really like to generate these masks/filters programmatically, but my understanding of how they are processed (Especially on the leaf) means for now I'm doing them by hand, in a linear array. I also want to be able to filter for a larger range of codes, while possibly excluding noise, and end the output before the buffer is full. I've attempted to add more bytes to ATFC, like ATFC180176(00), to attempt to filter for two or more messages, doesn't work like that. Telling the ELM to filter two or more message ranges at the same time would be golden. Maybe a complex mask? At the moment, I've spent as much time on it as I can, and need to get feedback so I can refine the numbers. I'll be using this app daily, so will working on it in bursts. I'm willing to share source code, especially if there's anyone interested in digging into it, my end goal is to share this with others to improve their Leaf driving experience. Replace "true" and "false" with "yes" and "no." Charge your 12 volt battery! It's near dead. Thanks! That is an easy change. I would love to replace that Lead Acid toxic hazard with a nice lithium pack. This is awesome... I have a large 6" display phone that I'd like to try it on. I've been using leafspy and it's great, not the prettiest app though. Had no charge amp/volts and would it be possible to put metrics? Great app! I'd strongly suggest not showing GIDs by default and only show them for old timers that want to enable them from a options setting somewhere. Max GIDs and comparing GIDs from one car to another is a minefield as they are variable, not a fixed unit of energy. claude274 wrote: Had no charge amp/volts and would it be possible to put metrics? Great app! 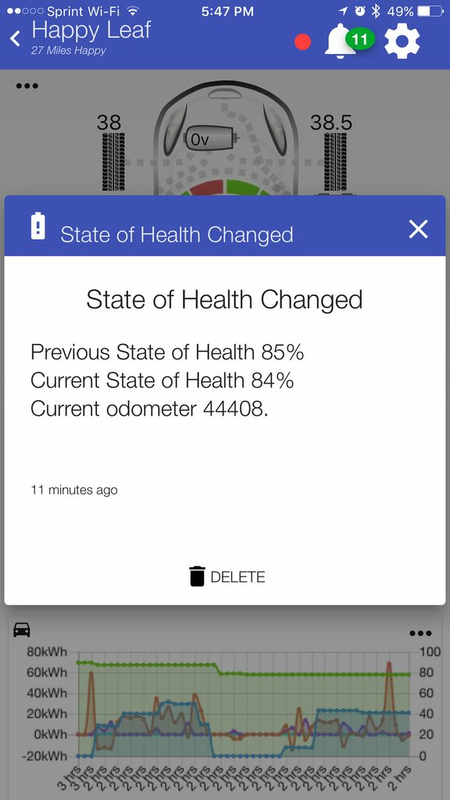 Metrics should work, Km is read from the car and changes units automatically. 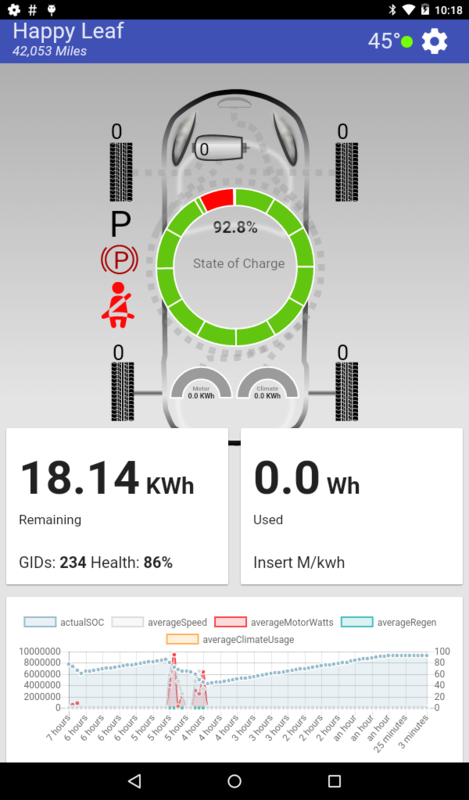 Charging Amps/Volts may not work on 6kw charging at this time. dhanson865 wrote: I'd strongly suggest not showing GIDs by default and only show them for old timers that want to enable them from a options setting somewhere. 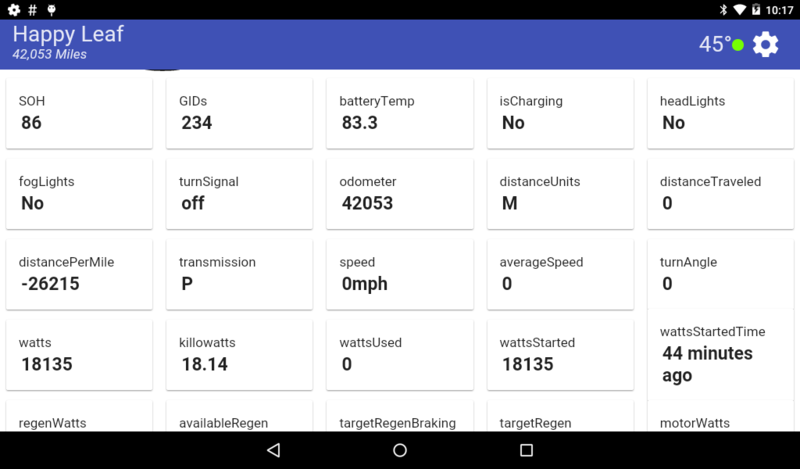 I don't do any comparing GIDs to a "maximum value", but GIDs are actually the only way to calculate watts remaining (at least the OBD messages I can read). 1 GID = ~77.5Wh. I compare this with SOC to get SOC per GID, and fine tune watts left/watts used based on this. I suggest you have an "expert mode" that enables GIDs and the graph(s). That way you have a mode that's very easy to read at a glance, and a mode that provides all data needed by more experienced EV drivers. LeftieBiker wrote: I suggest you have an "expert mode" that enables GIDs and the graph(s). 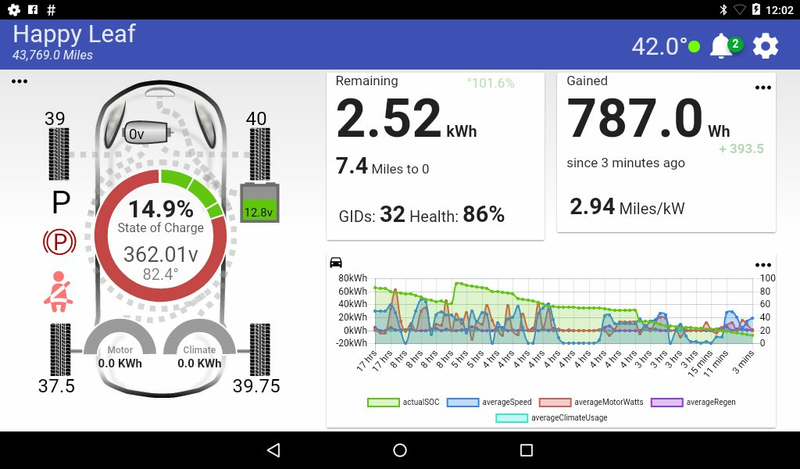 That way you have a mode that's very easy to read at a glance, and a mode that provides all data needed by more experienced EV drivers. The interface will be fully customizable, the cards will have the ability to move, change size, and display any data the user wants. Adding new cards coming soon.